Lakesides Ballroom Length - 30 meters Width - 23 meters Height - 4 meters Maximum Theatre Style Capacity - 250 Maximum Classroom Style Capacity - 130 Maximum Cocktail Style Capacity - 500 Maximum Banquet Style Capacity - 300 Maximum Dinner - Dance Style Capacity - 300 Meeting rooms have windows for natural daylight that can be effectively blacked out. Lakeside Ballroom incorporates all 4 Lakesider rooms into one large room. This room can be used for any function from cocktail parties to product launches and small business meetings. Lakeside 1 and 2 Length - 11 meters Width - 10 meters Height - 4 meters Maximum Theatre Style Capacity - 70 Maximum Classroom Style Capacity - 40 Maximum U Shaped Style Capacity - 30 Maximum Boardroom Style Capacity - 20 Maximum Cocktail Style Capacity - 80 Maximum Banquet Style Capacity - 80 Maximum Dinner - Dance Style Capacity - 50 Meeting rooms do not have windows for natural daylight. Lakeside Rooms 1 and 2 are separate rooms but can be combined into one large function space. These rooms are ideal for meetings/ training/ smaller functions. Lakeside 3 and 4 Length - 16 meters Width - 10 meters Height - 4 meters Maximum Theatre Style Capacity - 100 Maximum Classroom Style Capacity - 50 Maximum U Shaped Style Capacity - 50 Maximum Cocktail Style Capacity - 150 Maximum Banquet Style Capacity - 100 Maximum Dinner - Dance Style Capacity - 80 Meeting rooms have windows for natural daylight that can be effectively blacked out. Lakeside Function rooms 3 and 4 are separate rooms but can be combined into one large function space. These rooms are ideal for meetings/ training/ smaller functions Boardrooms 1 and 2 Length - 9 meters Width - 4 meters Height - 3 meters Maximum Boardroom Style Capacity - 12 Meeting rooms have windows for natural daylight that can be effectively blacked out. Ideal for that meeting away from the office. 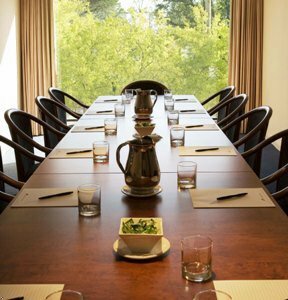 Fully equipped with large board room table/ overhead lighting.